Rustic Wooden chalkboard heavy duty substantially built Pavement Signs, Chalk Menu and Specials boards. These products are exclusive to HFE and are hand crafted in the HFE Joinery workshop based in the Midlands (UK). Custom sizes are available at special request. Stock items are available for Next Working Day UK Delivery. These products are particularly suitable for Farm Shops, Tearooms, Coffee Shops and Country Pubs looking for that Rustic effect. Chalkboards are becoming a popular way for eating and drinking establishments to advertise their business. HFE have created a line of exclusive heavy duty Rustic Chalkboards which can be used to bring footfall in off the street and also for food menus, wine lists or wise proverbs. 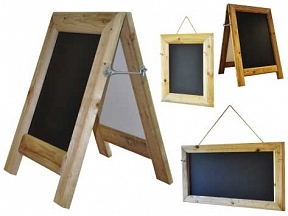 We have a range of Rustic Chalkboards available, including the Heavy Duty Large Chalkboard that is manufactured by HFE and uses heavy-duty pressure-treated timber. There is also smaller version which also has chalk panels suitable for traditional and liquid chalks. Our Rustic Chalkboards are likely to prove popular with a variety of businesses including farm shops, cafes and tearooms. These classy products demonstrate to customers that businesses are proud of the food, drink and overall service that is provided, especially when they are independently run. The great thing about the chalkboards is that a member of staff can change the sales message, menu or information on a regular basis, rather than simply go with a generic sign where there is no flexibility to make alterations. Many pub landlords will also enjoy using the chalkboards, products that are often seen in city centres in addition to rural areas. The boards can be used for a variety of marketing messages, including live entertainment, drinks deals, menu options or when the football will be shown live on TV that weekend. There is a Rustic Small Menu Chalkboard and a Rustic Large Menu Chalkboard that can be used in tandem depending on what is being served at your café, pub or restaurant. The menu chalkboards are supplied with a hanging rope, which continues with the shabby chic theme that customers warm to. There is a growing consumer trend towards farm shops, with customers more conscious about organic produce and looking for more choice when it comes to their eating habits. Many farms are diversifying when it comes to creating farm shops, cafes and even wine evenings which is where the Rustic Chalkboards can come into their own. Should you have an establishment that offers daily specials, then the menu chalkboards are a fantastic way of displaying the various food options rather than have a member of staff recite them. Indeed, there’s the choice with the small menu chalkboard to even transport it from table to table so that customers can order in a bespoke fashion. If you’re running a tearoom or a coffee shop, then the use of a chalkboard will distance your business away from the generic and homogenous high street brands and breathe a warm tone for customers to enjoy. You can give your establishment more of a personality through the messages that are written on a rustic board. The chalkboards and menu boards at HFE can provide the consumer with a quality display through their user journey. A large rustic board can attract potential customers and the menu boards can act as a versatile way to display a wide range of menu information.